Macromol. Chem. Phys., Vol. 217 (2016), 2576–2583. Macromol. Chem. Phys., Vol. 217 (2016), 2576–2583.. The dynamic phase separation behavior in aqueous solutions of poly(N,N-diethylacrylamide) (PDEA), which is a representative thermoresponsive polymer, is studied using a laser temperature-jump technique combined with transient photometry, with which the time constant for phase separation can be determined. Two components of the time constant (τfast and τslow) are clearly observed irrespective of the polymer concentration or molecular weight of the PDEA. 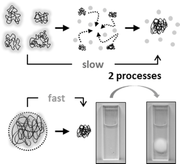 Such a fast phase separation component (τfast) has never been observed in poly(N-isopropylacrylamide) (PNIPAM) systems. Furthermore, the slow phase separation process of PDEA is faster than that in a PNIPAM system. It is shown that the fast phase separation process for PDEA originates from polymer aggregates formed even below the cloud point. The phase separation mechanism of PDEA is similar to that of poly (alkyl vinyl ether), rather than PNIPAM.